This year a new production company called Enchanted Entertainment were in charge of this year's show and they went for one of my favourite pantomimes, Snow White and the Seven Dwarfs. 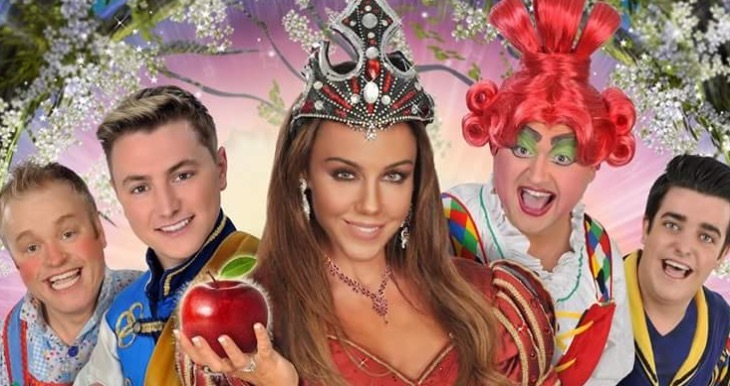 With a cast featuring Geordie star Michelle Heaton as the Evil Queen, Matt Pagan from Britain's Got Talent winning act Collabro as Prince Collabro and Britain's Got Talent finalist Danny Posthill as Dame Dotty Donut. 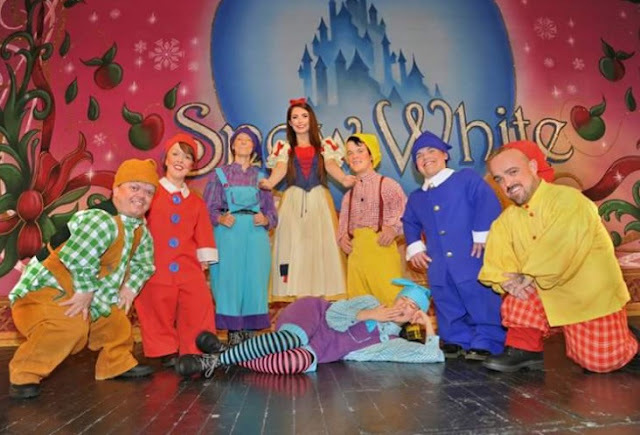 It also featured local ITV Tyne Tees presenter Rachel Sweeney as the magic mirror, local lass Robyn McEnaney (who was a former Disneyland Paris Princess) as Snow White, Lewis Denny as Herman and Tyne Theatre favourite Charlie Richmond as Muddles. As soon as the curtains lifted the show was off to an energetic start with the cast performing 'Footloose' before taking us through the classic tale of Snow White. The very Geordie Muddles had the young children in the audience laughing along as most of the jokes were aimed at the younger audience members rather than the adults. Michelle Heaton was brilliant as the Evil Queen Rubyana, she got plenty of boos from the children in the audience and proved just what a great singer she is with her fabulous rendition of 'Venus'. The nod to her past with the addition of her Liberty X hit 'Just a Little Bit' and joke from Muddles about liking her better in Hear'say - a rival band back in the day. Matt Pagan showed off his singing talents too with a great rendition of 'Shut up and dance' with Snow White. I loved the addition of the live band playing as it was a nice touch throughout the show, however, I found quite a few of the songs in the show to be a bit dated and the younger audience did not recognise them. One thing I was not a fan of though was the Ghostbusters scene as local Whitley Bay panto is famous for this and sadly the cast of Snow White did not pull it off as well as Whitley Bay do. The Wor Hoose song almost made up for it though as that was a great song that worked well sung with a Geordie dialect. The seven dwarfs were humorous and you could not help but like them, even grumpy Prof. I also really liked Dame Dotty Donut played by Danny Posthill as the range of voices he can do is incredible and he worked really well alongside Muddles and Herman. I also really liked the fact that this is a proper Geordie panto, with lots of Geordie phrases, a very Geordie Muddles and lots of references to local places throughout. I found Prince Collabro and Snow White to be a perfect match, they worked so well alongside each other and sounded great when they sang together. The Royal Wedding scene at the end was everything you would expect from a panto with the cast all dressed up in their glad rags for the Royal Wedding and a happy ending for all. It wouldn't be panto without a disco medley at the end and that is what we got featuring the whole cast. Snow White and the Seven Dwarfs is running at the Tyne Theatre & Opera House until Sunday 31st December with tickets starting at £16. You can book tickets online at www.tynetheatreandoperahouse.uk or at the box office. The show runs for 2.5 hours, including a 20-minute interval, although the show we went to did overrun slightly. Disclosure I received complimentary tickets to this show for the purpose of this review, however, all opinions are my own. My daughter would love to watch this show for sure. Sounds great.